In the 1920s the Town of Palmerston was in its prime, the archetypal railroad town. At one point, forty trains per day passed by the station and the under the old iron bridge during their trans-Ontario journey towards Listowel and Harriston. At the time, it seemed as though the town was poised to become an economic powerhouse in the very near future, serving as a kind of hub city along the C.N.R. rail routes. 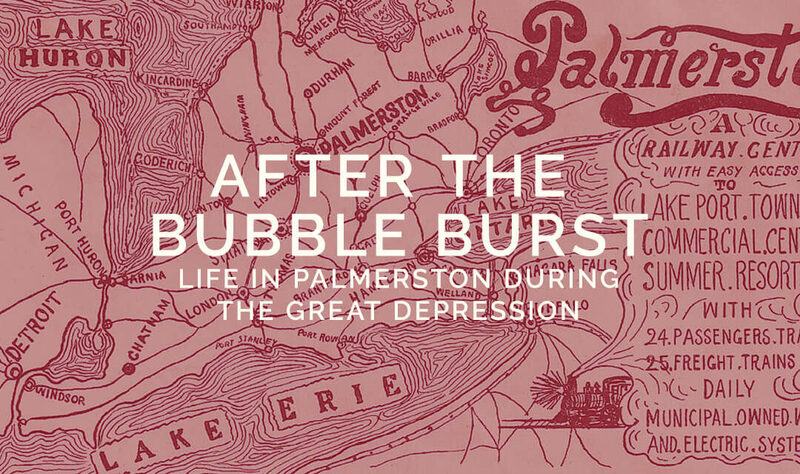 However, like many other small towns of its ilk, Palmerston would be hit hard by the Great Depression, which was, unfortunately, just down the tracks. Come 1933, Palmerston, along with the rest of Canada and much of the world, was in the midst of the greatest economic depression that the world had ever seen. While much has been said of how the Great Depression affected life in larger urban centers, not as much attention has been devoted to small-town Ontario. In this article I will be examining articles from the editions of the Palmerston Observer between the years of 1933 to 1939, in order to construct a portrait of what life may have been like for those living Palmerston, and the surrounding area, during these trying and unprecedented times. The search for a job became a pathological activity for those affected by the Great Depression, with large swaths of unemployed quickly creating unprecedented competition for every job that was available. For example, the Palmerston Observer noted that over 400 applications, including out-of-town applicants, were sent in for the position of Public Utilities Manager, and in a town of roughly 2,000, this is a huge number. The job ultimately went to E.W. Oke1, who was from Toronto, showing just how far people were willing to travel to find employment, during a time when traveling was not as simple as firing up a car and hitting the road. This level of competition, of course, meant that many people were left without jobs, and thus, were essentially forced to be permanently unemployed for the duration of the Depression, leading to the transient phenomenon which will be discussed in greater detail below. Even if you were lucky enough to have a job during the Depression, it did not mean that you were going to escape the times unscathed. Wage reductions were an ever-present threat during the depression, and they could affect anyone within the public or private sector, however, public sector workers seemed to bear the brunt of it, at least in Palmerston. Some examples of this include Wellington county officials having their wages cut by 20%2, carpenters in Guelph receiving a 25% wage reduction3, and high school teacher salaries in Arthur being cut by 15%4. These specific examples reflect a broader trend within Ontario as a whole, which led to an ever-shrinking tax base when the tax-revenue was needed the most. Indeed, in 1933 Milton reported that they were owed $24,000 dollars in unpaid taxes5, simply from people not having the money to pay them. Those who were left behind during the Depression (and there were a lot of them) found themselves without jobs and often looked down upon by their community. This led to some people acting out in destructive ways. The Observer writes of one such incident, stating that, “unemployed men in Midland [were] causing trouble, threatening to break things with an ax”6, while such actions are, of course, unacceptable, it is not hard to imagine the source of their discontent. Thus, we can see how the self-destructive cycle formed, with the “haves” looking down on the “have-nots” for their destructive behavior, which, in turn, was caused by the stigmatization they faced from society due to their unemployment. This divide continues to this day, with many people having contempt for those worse off then themselves, rather than compassion. Entering the workforce as a young person is difficult enough during normal economic times, but during the biggest depression in history, it became almost impossible. An article in the Observer titled “The Youth Problem” states that there was a “lack of opportunity […] [facing] bright and energetic lads”7 at the time, also noting that “there is no place for them. Some are marking time, waiting for an opening, staying on at school. […] many who cannot afford to be unemployed have taken to the road”8, becoming the transients that would soon be seen as one of the defining features of the Great Depression. Thus, it would become obvious that the youth would need some kind of outlet to channel their energies into. One outlet was church youth-groups, who regularly met and held special events for members of the community to attend. A particularly topical event for the time was a so-called “Depression Party”, which divided the group into four different teams: the transients, tramps, church mice, and hobos”9. The teams competed in a series of games in order to earn a “meal ticket”10, which they could then cash in for lunch. The meal itself was “served on a table covered with newspapers and the light was provided by candles held in catsup bottles”11. While the party itself was most likely nothing more than a bit of levity during trying times, it is interesting to note that even in the middle of the depression many of the tropes that we associate with it today have already been defined. For example, transients, one of the team names assigned to the youths, would eventually become synonymous with the Great Depression, and to this day is one of the main things people think about when the Great Depression is mentioned. During the Great Depression hordes of unemployed people took to the rails to try and find work wherever they could. Riding the rails to different towns, while not strictly legal, was the best way for people to look for work without having to spend any of their nonexistent money. Palmerston, being a railway hub, saw many of these people passing through the town, some of whom, unfortunately, were not of favorable character. This led to what was known at the time as the hobo problem, with many articles in the paper being written decrying these transients, and, in turn, vilifying those who were out of work as a whole. For example, in an article printed in the April 3, 1933 edition of the Observer describes a new “drive on hobos”13 program being established in Guelph, where police stake out strategic points along the railroad and arrest transients. The article notes that in 1932 around 4000 transients were arrested in the Algoma district alone using this method14. Programs like the drive on hobos serve to underscore the underlying ideology of the time, a marked distrust of those who were out of work and / or on some kind of relief program. Throughout 1933 there are multiple examples within the Observer of people calling for those on aid to be taken off of it, and characterizing them as lazy people who enjoyed living on the so-called dole. Whether or not this generalization held any truth, it was an idea that was prevalent during the time. In 1934, however, we begin to see a slight shift in tone when talking about the transient problem. For example, an article in the Palmerston Observer describes the story of a 61 year old transient, who had been jobless at the time for 3 years. The reporter of the article seems surprised when the transient states “I don’t keep wandering around in this kind of weather because I like it”15. This point, which may seem obvious to most, seems to cause some soul-searching within the reporter, who states that he had never thought of transients in that way before. Whether or not the reporter was genuine when writing the article, it marks a shift towards humanizing those people who were down on their luck during the Depression. This sentiment continued in another article which describes how a transient was kicked out of town and forced to walk from Elmira to Listowel in the midst of a severe winter storm. Here the reporter characterizes the Depression as being the result of a “bungled economic system”16, and further states that people should “give the unfortunate a helping hand”17. This is a far cry from from earlier articles within the Observer which frequently criticized those who were on relief, many of whom could legitimately not find a job no matter how hard they searched. While 1933 was a year marked with joblessness, transients, and general discontent, the coming of a new year brought renewed hope to Palmerston, and the surrounding areas, hope that they could somehow turn around the shambling economy that had afflicted their community for the past few years. C.A. Watt, the mayor of Palmerston at the time, made this his main goal for the year of 1934, with the Observer writing that “His worship dwelt at great length on the subject of economy, which virtue he felt must be the distinguished mark of the council of 1934”18. While these efforts were, of course, unable to turn the tide of the depression, this focus on the economy demonstrates the towns willingness and desire to adapt to the harsh times that were now facing Palmerston, as well as Canada as a whole. The mayor of Palmerston was not alone in his optimism concerning the new year, E.W. Beatty, the Chairman and President of the Canadian Pacific Railway (C.P.R), stated “Of 1933 I think it is perhaps with relief that most of us will say – that’s that, and now for 193419. If Palmerston was paying attention to what Beatty was saying, they may have taken heart, as although the C.P.R itself did not do business in Palmerston, they were a railway town through and through, and relied heavily on the C.N.R to provide work for a large part of their population, thus, a booming railroad industry would mean a booming Palmerston. Optimism was, of course, not the only feeling being espoused during the early parts of 1934. On March 8, the Observer published an article noting the growing trend of employers in Palmerston “replacing men by means of tender”20, stating that the phenomenon had become “an epidemic in Palmerston”21. In an effort to save money, employers began replacing local, full-time workers, with shorter-term, cheaper contracts. Why were they doing this? The Observer offers two potential reasons, neither of which bode well for Palmerston, stating that they did it either due to “economy incompetency”22, or “a personal grudge”23. It soon became clear that the reality of 1934 was that like 1933, jobs were going to be in short supply, and private industry, by and large, was not the place to look for charity. Thus, unemployment, while still stigmatized, was beginning to be thought of in a different light by society. The Observer notes that “almost complete readjustment of the public attitude towards idleness has been necessary during the past year of two”24, and that “it is not their fault [the unemployed] and they are not to be judged by the old standards”25. By recognizing that many people were left unemployed through no fault of their the way was paved for forward-thinking people to begin looking for solutions to the unemployment problem by setting in their sights that system that brought about such troubled times, unchecked capitalism. Tough times often allow for new ideas to take hold, and this was the case with the Co-Operative Commonwealth Federation (C.C.F. ), a socialist political party that wished to offer an alternative to the economic system that had resulted in the worst financial conditions up to that point in time. Change, especially change that is as ambitious as this, is often met with heavy resistance, as we can see in the Observer itself. For example, an article titled simply “The C.C.F.” leans heavily on anti-foreigner rhetoric and fear-mongering in an attempt to undermine the message of the party, likening the it to Communist Russia and stating that it hold non-Christian values for holding a political rally on a Sunday26. Despite this criticism, the C.C.F. still managed to hold a meeting in Palmerston in November of 1933. The C.C.F meeting in November, while sparsely attended, still took up a large portion of the front page of the Observer that week. The goal of the C.C.F was to “overcome the present condition, depression”27, through a new economic system that would see the goal of production changed to “the supplying of human need instead of making profit”28. It is easy to see how during a time of severe economic depression, empowering the workforce would seem like an attractive idea to a large amount of people, even if they were ultimately unable to act out their plans. Despite the small sliver of growing empathy for those left unemployed during the depression, transients were by and large, still viewed in a negative fashion, especially within the Palmerston Observer. Even when they managed to find work through government programs, they continued to be looked down upon. For example, an article reprinted in the Observer from the Fergus-News Record describes how the reporter viewed some men working on a highway as having “never been good workers, and never will be, and in past years they lived on their relatives or by other devious means”29. The writer also criticizes how some of the men were taking a break from their work, thus, even when transients do find work, they are not working hard enough for some people. Perhaps the constant stigmatization and alienation from society, as described above, could help to explain why a seemingly sizable portion of transients turned to alcohol as an escape from their problems. Articles within the Observer during this time often highlighted the drunken exploits of transients, who were often depicted as interfering with the lives of ordinary citizens, due to their alleged laziness and drunkenness. While this no doubt occurred during this time period, there is also no doubt that the Observer disproportionately focused on the negative actions of this specific group, creating and furthering the divide between the have’s and the have-not’s during the depression. Again, the “othering” of the poor is something that is still in full effect today, with many people clinging to the old-time depression-era “bootstrap” mentality, where the poor have only themselves to blame, rather than any systemic inequality. This type of mindset led to the creation of a relief problem in Palmerston, with many people opposing the giving of any aid to those who were effected by the realities of the depression. The relief issue was frequently discussed in the Observer during the 1930’s, and one article, taken from January of 1935, was emblematic of the viewpoint the Observer took on the relief problem. The article states “as long as these men [unemployed / transients] can depend upon hand-outs in the spirit of “the world owes me a living” they will make no attempt to settle down and find steady employment”30. This article was soon followed up by the headline, “Men Receiving Relief Not Anxious To Work”31, and then, the end goal for those involved in perpetuating these headlines, “Relief Will Be Discontinued By Council After May 15”32. Soon after this decision was announced, an article ran in the Observer titled, “Nine-Tenths of Population Are Better Off Today”33, which argued that there was much to be said “for the theory that the depression, so far as domestic conditions are concerned, is in part a habit of mind”, this article seems to be an attempt to assuage any guilt people may have had over relief being discontinued for those in need, as now all it was clear that all of those poor people were not really in need, they just needed an attitude adjustment. Thus, the transition from direct relief to work-based relief began in Palmerston. In the June 13th edition of the Observer, it was noted that a “Relief Work Program [was being] […] Proposed by Town Council”34, whereby people could work on projects that benefit the town and get paid a fair wage doing so. Of course, this move had its own share of problems, and in little over a year it would be noted within the Observer that “it appears as though a man would have to go on relief to secure work, which is certainly a vicious system”. This is a fair criticism, and points to the larger problem of the depression, because there was little work to be had in the private sector, people had to look to the government for make-work projects, where employment was only offered to those on relief. This system was clearly unsustainable, and what was needed was for the government to ensure that citizens had money to spend at businesses, which would in turn allow businesses to employ more people. As time went on, the situation in Palmerston, like most other places in Canada, would slowly improve, leading to less and less relief being needed within the community, a situation that culminated between the months of August and October of 1936. In August, the Observer proudly announced that “Relief Grants Are Now Completely Discontinued”, furthermore writing that “with the complete […] cutting off of all recipients, administrators, and rate-payers alike, breathed sighs of relief”35. Then, less then two months later it is declared in the Observer that “as conditions were so much better than in former years no relief payments should be made this year”36, marking, at least symbolically, the end of the depression in the eyes of the towns officials. This, of course, was meaningless to those who still needed aid but now faced a much harder time getting it. In January of 1938, the Observer wrote of a case where a man was charged with attempted suicide after jumping in a river, noting that “he had had no food for several days […] had applied at the the police station for aid, and had been referred to the Welfare Office”37. Those who fell through the cracks near the end of the depression would be forced to continue to endure hard times until the beginning of the Second World War in September of 1939, where the war economy brought a renewed era of prosperity to much of the world, at least those who were lucky enough to remain untouched from the fighting. At the very least, while much of Europe and other parts of the world were facing destruction on a scale that had never before been seen, Palmerston, and much of Canada, were “really perkin up”38. 1 – “Public Utilities Select Manager,” The Palmerston Observer, 25 May. 1933, 1. 2 – “Wellington County Officials – 20% Salary Cut,” The Palmerston Observer, 13 Apr. 1933, 4. 3 – “Guelph Carpenters 25% Wage Cut,” The Palmerston Observer, 13 Apr. 1933, 4. 4 – “Arthur High School Teachers, Salary Cut 15%,” The Palmerston Observer, 11 May. 1933, 2. 5 – “Milton ~ 24,000 In Unpaid Taxes,” The Palmerston Observer, 4 May. 1933, 2. 6 – “Unemployed Men In Midland Causing Trouble, Threatening to Break Things With An Axe,” The Palmerston Observer, 11 May. 1933, 2. 7 – “The Youth Problem,” The Palmerston Observer, 1 Jun. 1933, 2. 9 – “A.Y.P.A. Holds Depression Party,” The Palmerston Observer, 27 Apr. 1933, 4. 12 – “Written By A Transient,” The Palmerston Observer, 8 Feb. 1934, 8. 13 – “Drive On Hobos,” The Palmerston Observer, 3 Apr. 1933, 5. 15 – “Must Keep On Going,” The Palmerston Observer, 25 Jan. 1934, 1. 16 – “Transient Forced To Walk From Elmira To Listowel,” The Palmerston Observer, 8 Feb. 1934, 5. 18 – “Economy To Be Distinguished Mark of 1934 Town Council,” The Palmerston Observer, 11 Jan. 1934, 1. 19 – Recovery Under Way E.W. Beatty Believes,” The Palmerston Observer, 22 Mar. 1934, 4. 20 – “What Seems To Be The Trouble,” The Palmerston Observer, 8 Mar. 1934, 1. 24 – “Out Of Work,” The Palmerston Observer, 29 Mar, 1934, 3. 26 – “The C.C.F.,” The Palmerston Observer, 13 July. 1933, 8. 27 – “Small Crowd Attend C.C.F. Organization Meeting,” The Palmerston Observer, 9 Nov. 1933, 1. 29 – “Unemployed At Their Work,” The Palmerston Observer, 10 May. 1934, 4. 30 – “Shifting Population Still Asking For Food,” The Palmerston Observer, 31 Jan. 1935, 1. 31 – “Men Receiving Relief Not Anxious To Work,” The Palmerston Observer, 25 Apr. 1935, 1. 32 – “Relief Will Be Discontinued By Council After May 15,” The Palmerston Observer, 9 May. 1935, 1. 33 – “Nine-Tenth Of Population Are Better Off Today,” The Palmerston Observer, 30 May. 1935, 8. 34 – “Relief Work Program Is Proposed By Town Council,” The Palmerston Observer, 13 Jun. 1935, 1. 35 – “Relief Grants Are Now Completely Discontinued,” The Palmerston Observer, 20 Aug. 1936, 1. 36 – “Relief Payments To Be Canceled,” The Palmerston Observer, 15 Oct. 1936, 1. 37 – “Mt. Forest Man Charged With Attempted Suicide,” The Palmerston Observer, 6 Jan. 1938, 1. 38 – “Palmerston Is Really Perkin Up,” The Palmerston Observer, 2 Nov. 1939, 4.